The Reizen Atomic Talking Sports Watch clearly announces time, date and more in a male voice. Automatically synchronizes with the National Institute of Standards and Technology's radio signal, bringing you the most accurate timekeeping technology available today. It even automatically adjusts itself for standard and daylight saving time, and can be adjusted for Pacific, Mountain, Central, and Eastern time zones. Comes with complete instructions and four easy-to-press function buttons. Easy to customize alarm, hourly time announcements and more, to your personal preferences. Note: The atomic function will not operate in Hawaii or Alaska because it cannot communicate with the National Institute of Standards and Technology. Therefore, in these states, it must always be set as a regular 'manual-set' watch. Calendar will not function in Hawaii or Alaska at all. Safe. Sturdy. Lightweight. Easy to use. Speaks clearly. Great in the dark. Elderly. I don't take my watch. Lightweight. I don't take my watch. Sturdy. Only can wear 1 at a time. Wish I had one sooner. Elderly. VA Vet - legally blind. Adds to Quality of Life. Viet Nam Vet l00% disable. 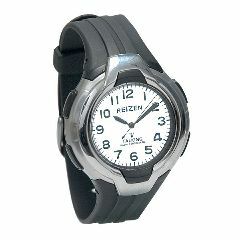 I bought this watch for my son-in-law who is now legally blind due to glacmoa and diabeties. He loves it as he can now just push a button and he knows what time it is. The watch even tells if it's AM or PM and has a button that tells the month, day and year. Great! Easy to use & hear; comfortable. Very easy for Dad to use & hear. Self-adjusting through different time zones makes traveling a breeze. Great watch. Handy to use. Lightweight. My eyesight is fine, but it would be a lifesaver for persons with bad eyesight. Atomic watch, like all other atomic timepieces in my house, doesn't change automatically for daylight savings. Directions for manual change of time? Is the Black Polymer Band on the other Atomic Watch expandable or a strap style? If strap, is an expandable available? My father has one of these also, and the band broke. Is there a replacement band available? I would hope the band is stronger to begin with. I have very small wrists-is there one for women? My father has one of these watches. Loves it. The band has broken into several pieces however. Do you have replacement bands?